Emotions were running high on Tuesday as an old oak tree on Featherston’s main street was set to be felled. It survived the day but its future remains uncertain. The tree sits on St Andrew’s Union Church land and members of the small congregation said it could no longer afford to pay the maintenance costs for keeping the branches away from two sets of powerlines that run through it. The church arranged with Powerco to have the tree trimmed back, and contractor Treescape was on site carrying this work out. Treescape was also preparing to bring the entire tree down as requested by the church, but this plan was brought to a halt just after noon and the tree was left standing. Treescape project manager Glen Ayling confirmed his team “left the site due to interference from a member of the public”. On Tuesday morning it was clear people weren’t happy with the job at hand, with members of the community speaking out in frustration at the church’s decision. Featherston man, Campbell Moon, said chopping the Fitzherbert St tree down was an “act of vandalism”. “This is a total outrage,” he said to church members. He said looking at old photographs, it seemed the tree was planted about 100 years ago. 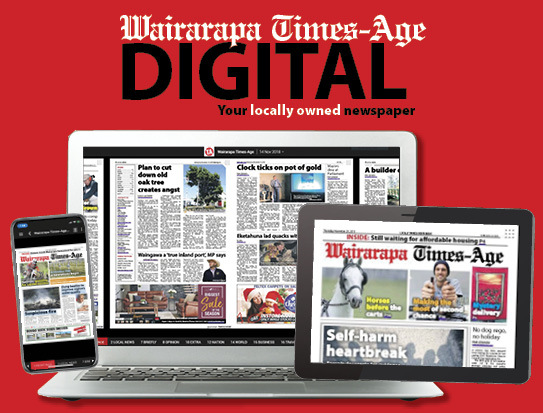 Greytown-based consultant arborist Richie Hill estimated the tree to be about 80 years old and said it could “easily” live another 800 years. He said it was worrying that felling trees seemed to be the go-to option when powerlines were involved. St Andrew’s Union Church secretary Faith Wrigley said the decision to fell the tree was made by the parish council and was based on safety reasons. “We have a tree that has powerlines going through it – it’s not safe for people going under it, it’s not safe for people who have their properties on the same powerlines. It cost the church between $1600 to $1800 up to twice a year to keep the tree clear of the lines. The church plans to donate the wood to the Lions Club of Featherston to distribute to families in need. 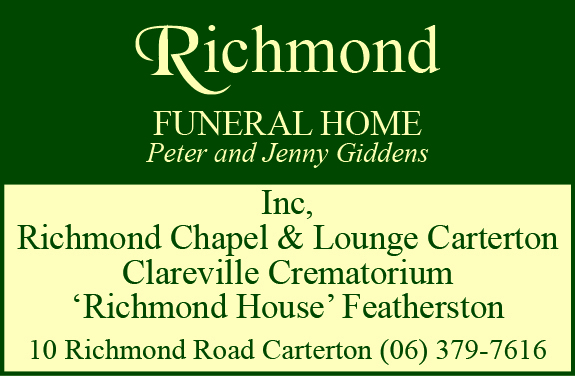 Damien Taylor, of the Featherston Business Association, said trees were vital for human health and environmental reasons, and the town needed more trees, not less. “We need to protect our heritage, and trees are part of that,” he said. Jeremy Thompson said, the oak added “amenity” to the town, being one of the few grand trees Featherston had. While he understood the church’s decision was made based on tight finances, it was still disappointing for the town. Powerco confirmed the oak needed trimming for safety reasons, and Treescape was contracted to carry out the work. Powerco did not own the tree so any future work on it was the responsibility of the church officials, senior vegetation manager Colin Winch said. 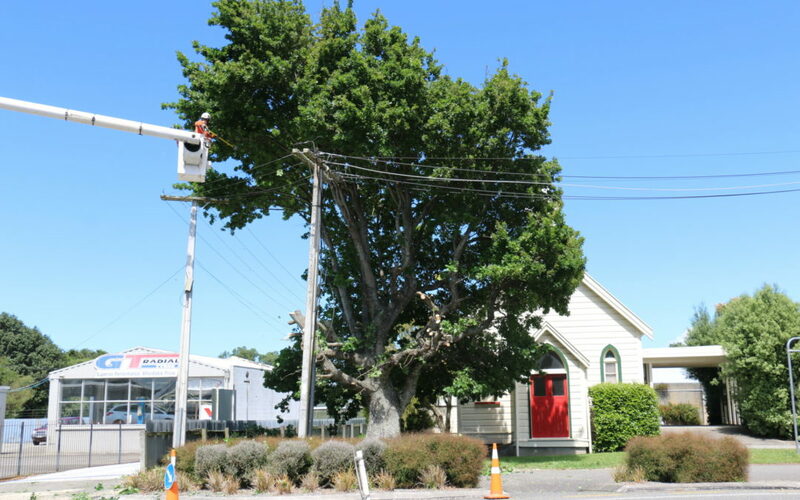 I’m a Featherston resident and as much as I love old trees, my own personal feeling is that sadly the tree actually looks rather ugly now that it has been pruned and tends to degrade the main street rather than improve it. I think in this particular situation the tree has simply become too large given the presence of the power lines. Common sense needs to prevail and for the safety of all parties involved, I think the tree should come down. I can appreciate the feelings of the local community about the much loved tree and I agree its a shame to take it down – however – I don’t see anywhere in this article where the people who are so against it coming down, are offering to pay the twice annual fee of up to $1800- each time, to keep it in check. The church have clearly stated that they don’t have the money, so come of people – open up your pockets and pay up. Don’t forget it is twice a year that you have to pay it. it would be nice to save the tree it is an icon in the town .. but to burn the wood from it is wrong .. the trunk is beautiful.